This gluten free and vegan wrap is beyond easy to make and so tasty, you will be craving it all the time! Simple, Nourishing and the Best Flavor! This has become one of my go to lunches— quick, nourishing and DELISH! And each time I share it on my stories, I get so many DMs, I decided it was time to finally add it to the website. 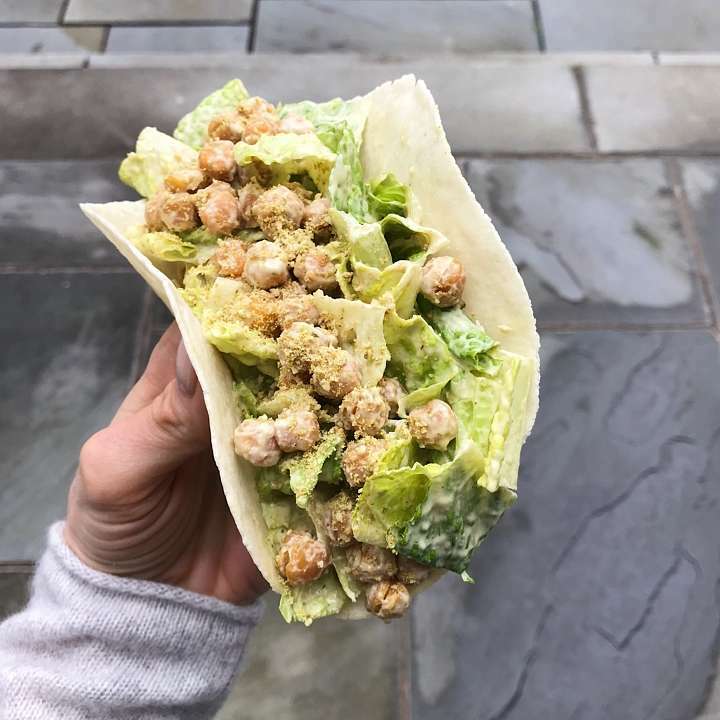 The concept is so simple… Crisp Romaine lettuce and roasted chickpeas tossed with an amazing Vegan Caesar Dressing , put in a wrap and topped with a Nut Free Vegan Parmesan. A few simple, whole foods ingredients combined into a one amazing dish! And it’s gluten-free, vegan and grain-free if like us you opt for a grain-free tortilla. We used Siete Foods Almond Flour tortilla. The reason this is so good is because of the Vegan Caesar Dressing. 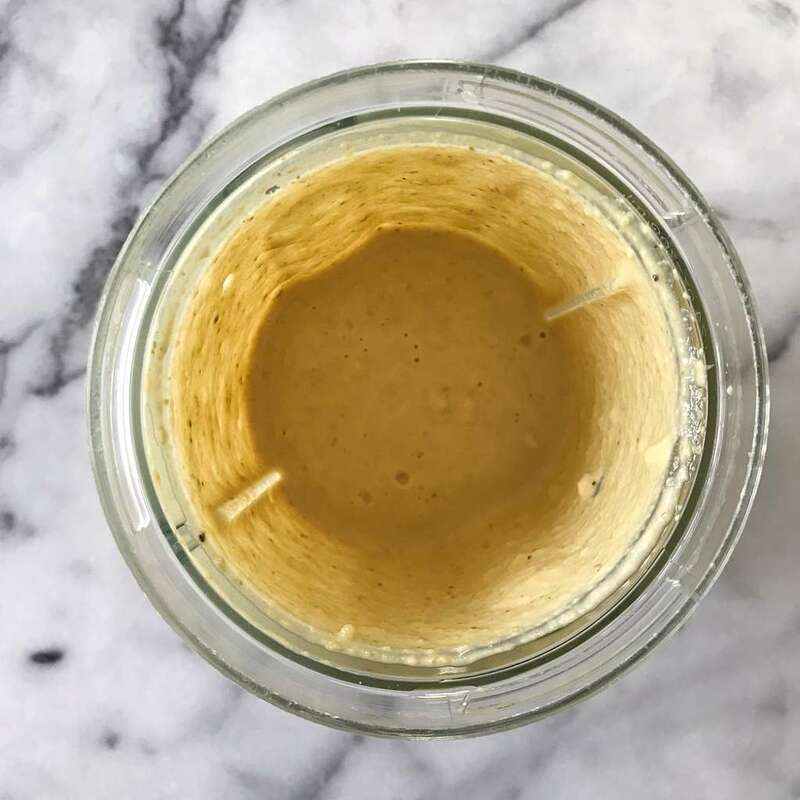 I love a good Caesar Salad dressing but have never been a fan of raw eggs so I’m always on the lookout for a great vegan alternative… I found it and am looking no further! This Vegan Caesar Dressing is unreal — packed with flavor and addictively delicious! Recipe from my good friend Corey @thevegansix , I have made it so many times since she first introduced me to it. Literally can’t get enough! 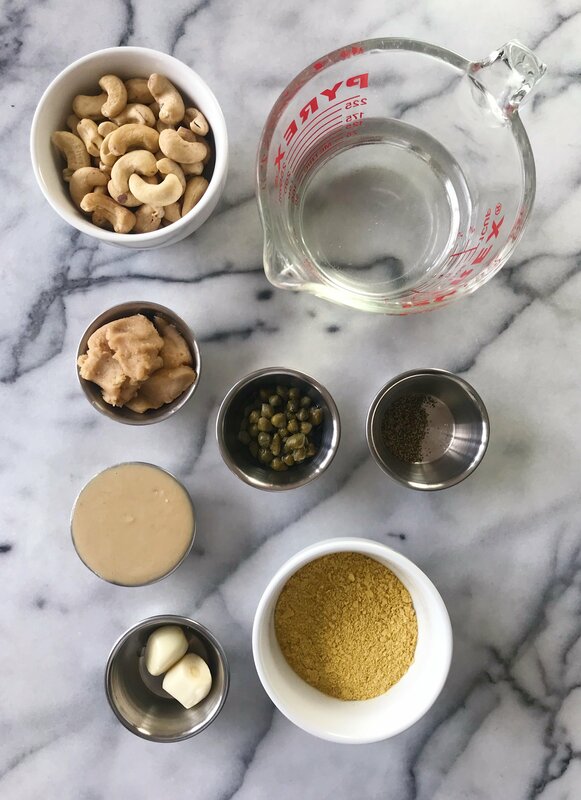 It’s just 7 ingredients — raw cashews, garlic, tahini, white miso, nutritional yeast, fresh pepper and capers — but the blended combination is magical. And you may have noticed, there is no oil either, which is a nice change from so many dressings. It’s creamy and so flavorful you’ll want to eat it by the spoonful! And if you’ve never used white miso or nutritional yeast, don’t be afraid to give them a try. They are staples in many vegan kitchens because of they add so much flavor but you will love having them in your kitchen even if you don’t follow a vegan diet. I use both ingredients in so many dishes, and both ingredients stay well in the refrigerator for months. The other magical touch in this wrap is the Nut Free Parmesan, also from my friend Corey @thevegansix. 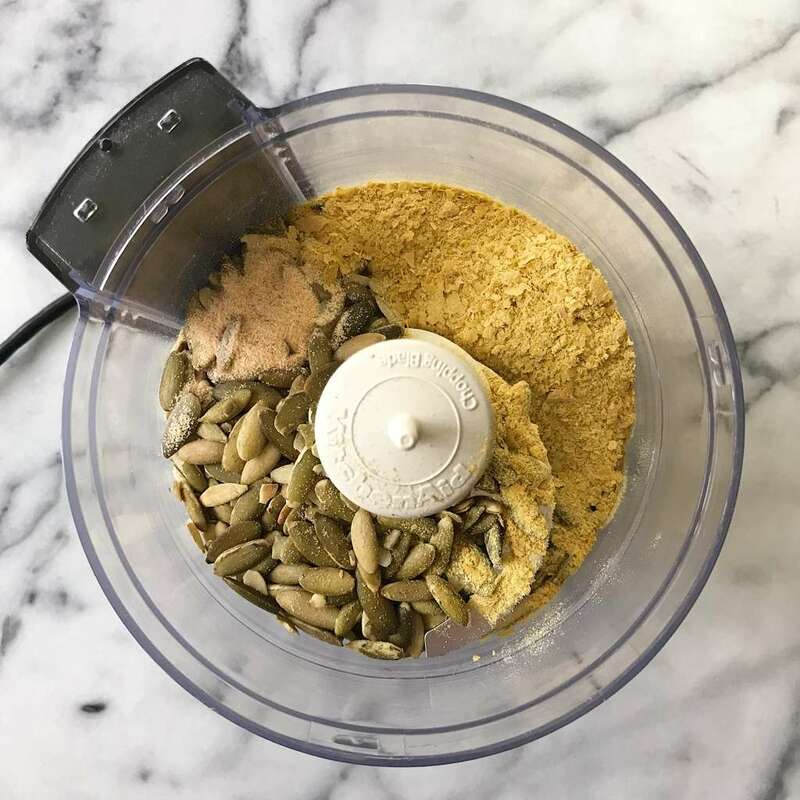 This is just 3 ingredients –roasted salted pepitas, nutritional yeast and garlic powder. And it adds the best finishing touch. Both the Vegan Caesar Dressing and the Vegan Parmesan make large quantities and store well in the refrigerator. But trust me, they won’t last long! You will want to put them on everything! Thanks so much to Corey @thevegansix for letting me reprint her recipes for No Oil Vegan CAESAR Dressing and NUT-FREE VEGAN PARMESAN! If you don’t know Corey, definitely check her out— some of my favorite easy recipes and you don’t have to eat vegan to love them! A quick note on the chickpeas… You could use them straight from the can but I highly recommend roasting them if you can. You could roast them as little as 10 minutes or up to 20 minutes depending on how crispy you like them and it adds the best flavor. Whether you try the wraps for a quick lunch or light dinner after a long day, I hope you love them as much as my husband and I do! Scroll down for the recipe and leave a comment if you try. 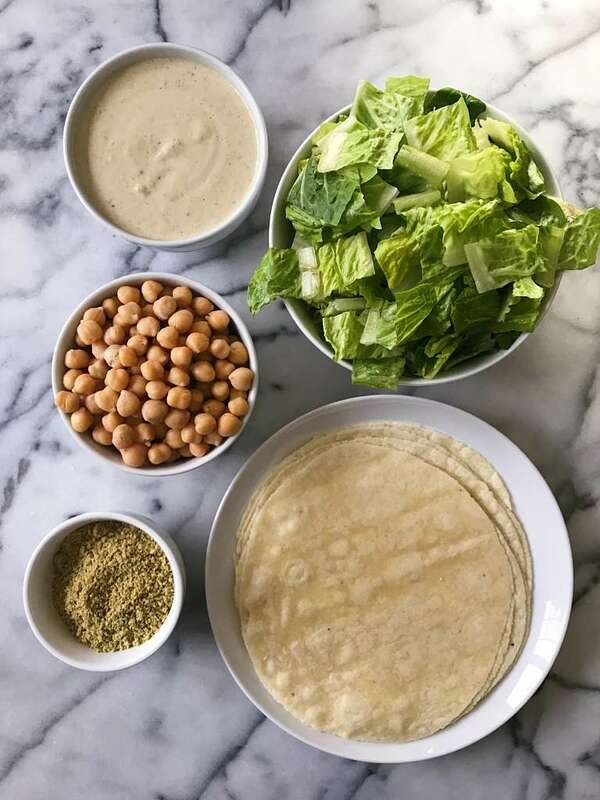 This gluten-free and vegan wrap is beyond easy to make and so tasty, you will be craving it all the time! Creamy No Oil Vegan Caesar Dressing and Nut Free Parmesan recipes from The Vegan Six. Dressing, parmesan and chickpeas can be stored in the refrigerator for several days. NOTE: prep time includes soaking the cashews for 30 minutes. Soak cashews in water in a blender for at least 30 minutes. Add remaining ingredients and blend on high until smooth and creamy. Set aside. Store leftovers covered in the fridge. Blend on high in a small blender or food processor. 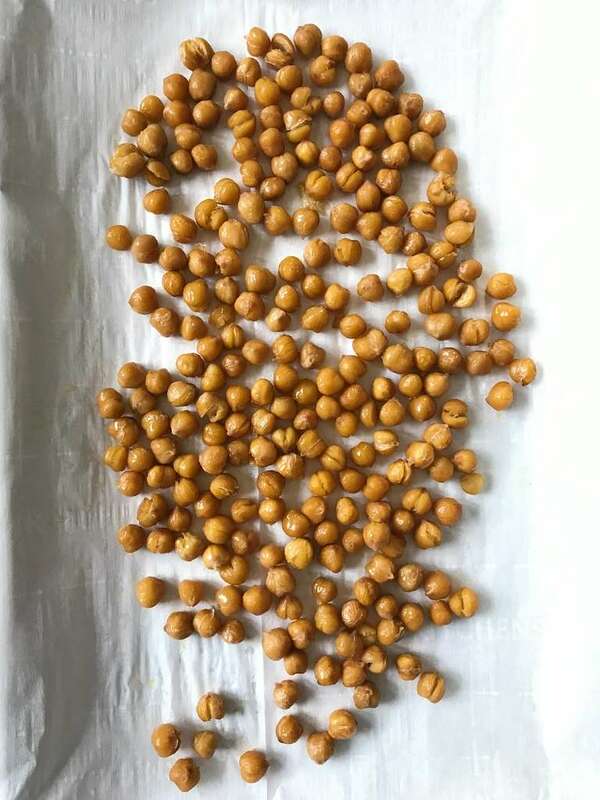 Place chickpeas on baking sheet, toss with oil and sprinkle with kosher salt to taste. Bake for 10-20 minutes depending on how crispy you want them. I tend to do 15-20 minutes. In a large bowl combine romaine, chickpeas and dressing to taste toss to combine, adding more dressing as desired. To each wrap, add the dressed romaine and chickpeas. Top with parmesan and enjoy!